In these "first activity" classes, your child will learn to focus his or her mind and body while having fun. Our non-violent approach to teaching our youngest members ensures that your child will understand the right time and place to practice techniques. 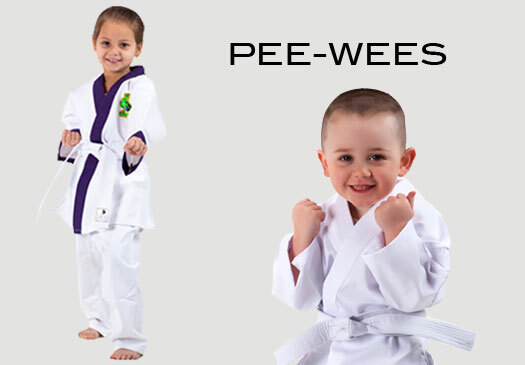 With an extra emphasis on courtesy towards fellow students and instructors, pee wee classes teach an invaluable life skill and anti-bullying tendencies. Goals/Rank Progression: Attendance, good behavior, and positive attitude earn our youngest members rewards. Target Drills: By working on applying martial arts techniques to instructor-controlled targets, your child will hone his or her balance, focus, and power. Stretching: Increase your child's range of motion. Stretching is done during each class. It will help to protect your child's body from everyday injury. Fun Drills: Applying martial arts to a game, Kickside Martial Arts offers your child a break from routine practices by playing games that are sure to put a smile on his or her face. Pee-Wee classes are offered 3 days a week.